China's "no stimulus" pledge and falling commodity prices are sending US inflation expectations to multi-year lows. 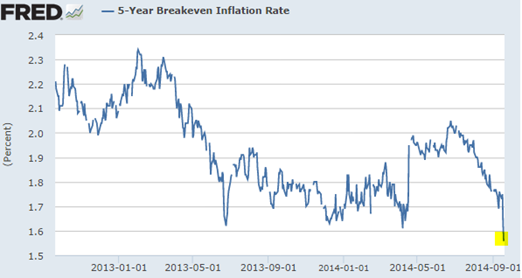 Below is the 5-year inflation expectation indicator (breakeven) implied by inflation-linked treasuries (TIPS). The 5-year real rates in the US have recently turned positive, which some would suggest represents tighter monetary conditions. With real rates on the rise, the Fed will have a great deal of room to "slowroll" the rate hikes. If inflation expectations fall further, we may see a more dovish stance from the FOMC.